Kilchoman, Islay’s newest distillery has proved that contrary to popular belief age is no barrier to success in the whisky world. 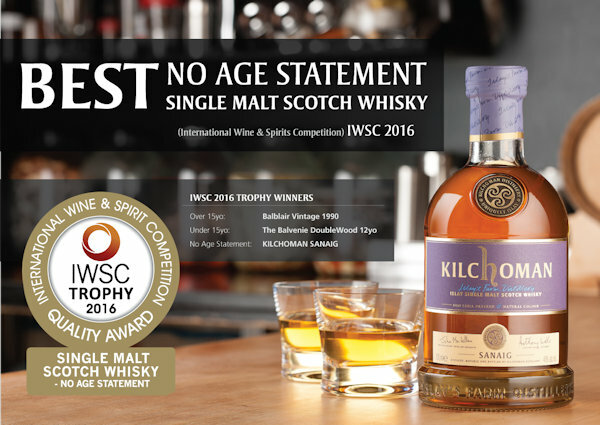 Having surprised many by being awarded Best Islay Single Malt at the 2016 International Whisky Competition, Kilchoman have since been awarded Best Single Malt Scotch Whisky (no age statement) at the prestigious International Wine and Spirits Competition (IWSC). NAS (Non Age Statement) whiskies now form the largest segment in Single Malt with almost 80% of Scotch Whisky sold not having an age statement, making Kilchoman’s success all the more impressive. Anthony Wills, Kilchoman Founder and Managing Director 'We are thrilled that Sanaig has been named the best Single Malt Scotch Whisky - No Age Statement in this year's IWSC. The IWSC is the most prestigious awards in the industry and is reward for the dedication and hard work of Robin Bignal, Distillery Manager and his team here at the distillery’. Kilchoman, founded in 2005, known as ‘Islay’s Farm Distillery’ was the first new distillery to be built on the famous whisky making Island of Islay for over 124 years. The family run operation has surprised many in the industry with the quality of their whisky ever since they first released a three year old in 2009. Kilchoman, although a new distillery, take a traditional approach to many aspects of their production and are currently Scotland’s only farm distillery, producing whisky from barley grown and floor malted on site by the distillery team. Machir Bay and Sanaig, the two award winners, form the distillery’s core range. Both peated, the difference in character is created by using different barrel types during maturation. Machir Bay is mostly matured in bourbon barrels while Sanaig has a predominantly sherry cask influence. The distillery also release a range of limited editions including Loch Gorm, 100% Islay as well as Sauternes Cask Matured and Original Cask Strength which will be available from later this year.